Background: Although bullying is associated with gangs, questions arise as to whether bullying, as such, takes place within gangs. Objective: To provide a critical analysis of bullying as this pertains to youth gangs and especially to violence within gangs, and as applied to the behaviour of individual gang members. Study group: Young men between 12 and 25 years of age. 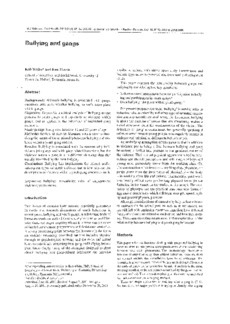 Methods: Review of relevant literature with a view to theorising the nature of the relationship between bullying and violence within a youth gang context. Results: Bullying is associated with the reasons why individuals join gangs and with gang-related behaviour, but the violence within a gang is of a different character than that usually described by the term bullying. Conclusion: Bullying has implications for related and/or subsequent types of street violence, but is less relevant for descriptions of violence within a youth gang context as such.